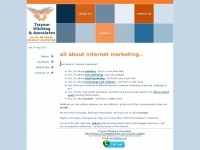 Just what is internet marketing? It's about websites, search engines, email, technology, software. But more - it's about knowing how to sell to people. That is our strength. In total 3 links were found which refer to Tka.co.uk. The most used keywords in text links are Traynor Kitching Associates and Traynor. Individual words like Associates and Kitching are frequently used in text links from other websites. The most important link sources for this website are Marketing-magic.biz and Management-datavault.com. The homepage of Tka.co.uk and the subsite are most referenced by other websites. The table shows the most important links to Tka.co.uk. The table is sorted in descending order by importance. The table shows websites of Tka.co.uk, which are often linked by other websites and therefore they are classified as important content. The web server with the IP-address 80.87.128.242 used by Tka.co.uk is run by Positive Infrastructure and is located in Great Britain. 16 other websites are located on this web server. Most of them are provided in the english language.